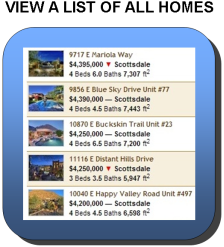 From this page you can easily browse all Troon North homes, condos, townhomes and patio homes for sale from the Arizona MLS. Our real estate listings are updated daily! Considered to be one of the country’s premier golf communities, Troon North has a distinctive collection of luxury homes that are situated adjacent to a 185-acre mountain preserve and two world-class golf courses in North Scottsdale. With cooler summer temperatures and spectacular city lights views, Troon North real estate is some of the most desirable throughout the Valley. Housing options include semi-custom, custom, production single-family homes, as well as townhouses. Prices for a Troon North home can range from $500,000 to over $5 million. The properties located on the fairways or within the gated communities command the highest prices, and some have guest casitas and yards that open directly out to the desert. For those wishing to build a custom home, sites are available for purchase. Thinking about selling your home in Troon North? Please Contact Us or call us direct at (480) 442-8255 for your complimentary home value estimate, or to schedule a consultation. 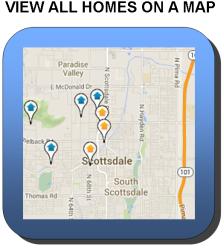 We're a local, experienced team of Scottsdale Realtors who can help you get top dollar for your home.